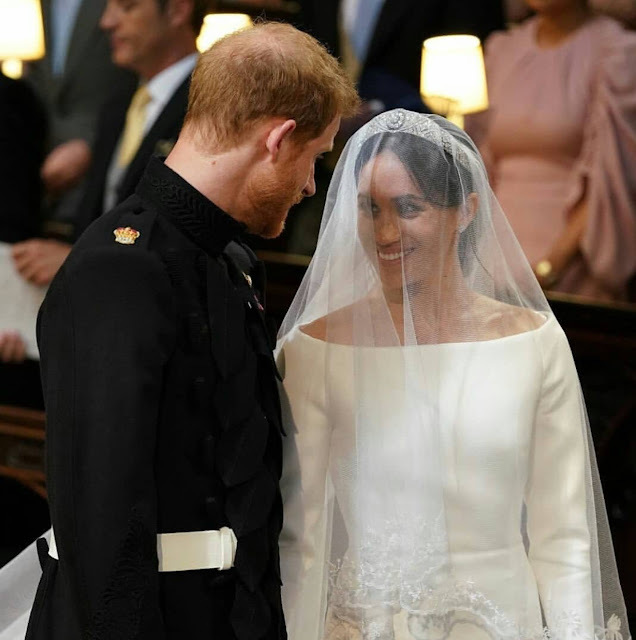 I along with millions of other people around the world tuned in last Saturday to watch an American actress marry a British prince. (Basically, my childhood dream) I woke up at 4:15 that morning and Dustin got up with me to watch this historic event. We moved to the living room, turned on the Today Show, and began to watch the guests arrive. 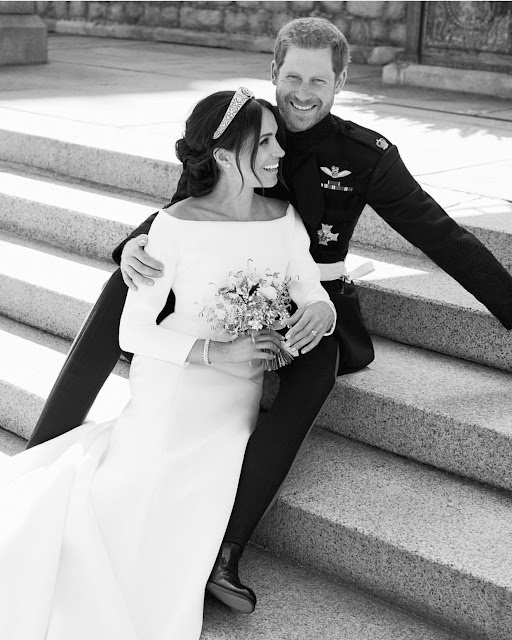 And after watching all of the pomp and circumstance and not really knowing anything about Meghan Markle, I've now become obsessed with researching her and finding out who she was before Harry. She's actually pretty interesting and it's also been fun binging Suits! Just like I did with William and Kate's wedding, I woke up early enough to watch some of the guests arrive. The British sure do know how to dress for a wedding! Now looking back at my own, I think it would have been really fun to add a note on the invitation about hats being welcomed! 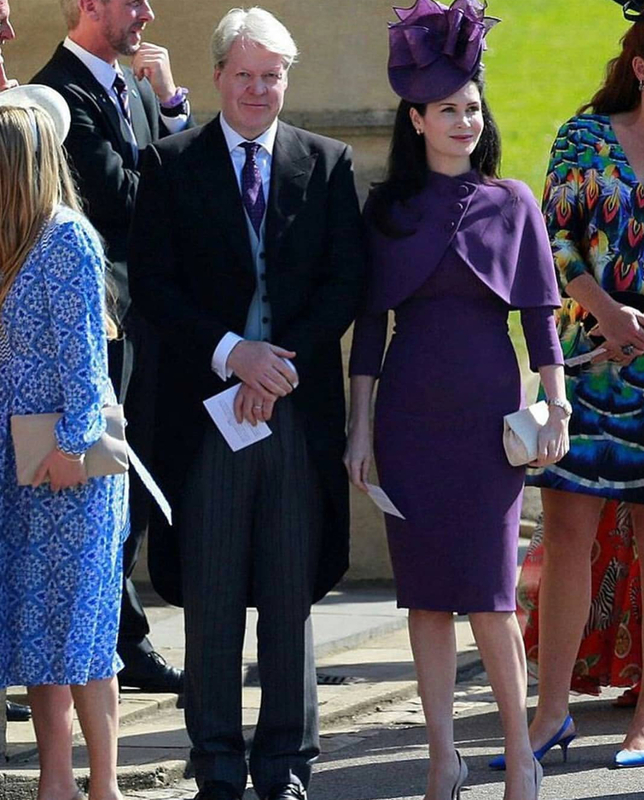 This is Diana's brother and his 2nd wife, and man, she looks great in purple! I've never thought about purple being a brunette's color, but it really is. If you're brunette, start wearing purple now because it looks amazing on this lady! Amal Clooney is ALWAYS stylish. I loved this dress and hat on her--the fit was impeccable. Now, I could not pull off this color, but she definitely does with her skin tone and hair color. 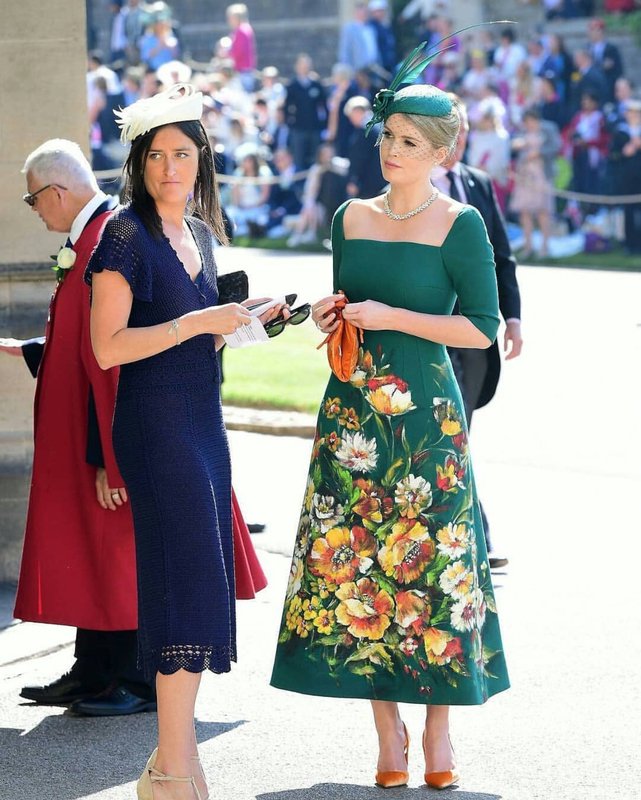 Kitty Spencer, Diana's niece, looked amazing, too. 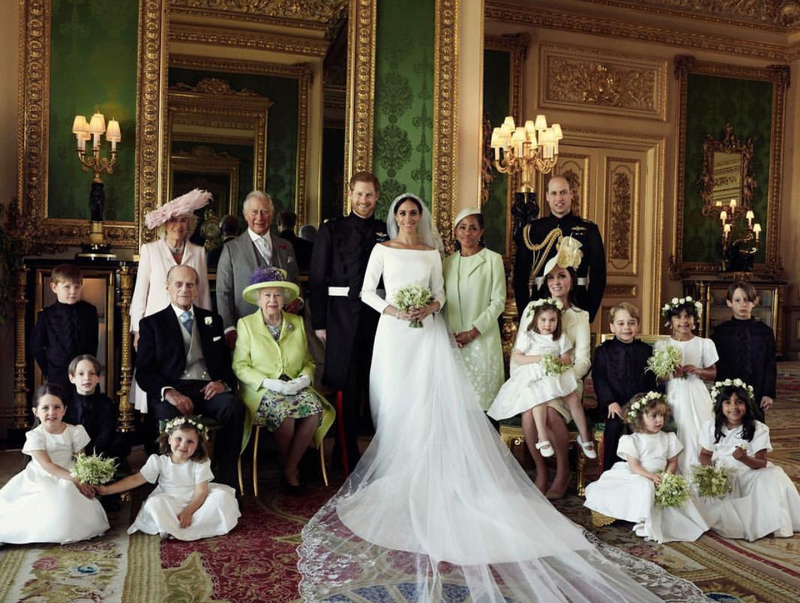 Again y'all, the British can dress for a wedding! I loved the green on her and her small fascinator works perfect with the print on this dress. Because the print is so overpowering, she did great wearing a small fascinator. Pippa Middleton is gorgeous but I was not a fan of this dress. I actually think it looks pretty on her waist up, but the pleats are not cute. James Blunt's wife killed it in this embroidered dress and coordinating fascinator! 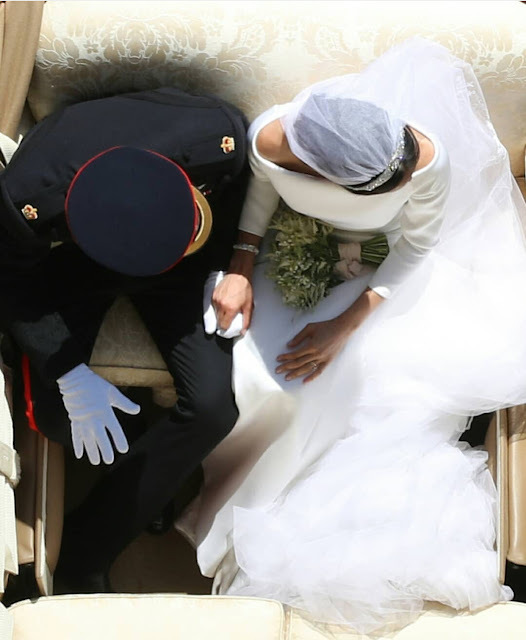 How many of y'all had predictions on what Meghan's dress would look like? 🙋 I didn't think she wold wear lace at all--it just doesn't seem like her--but I was not expecting the boat neck. I liked the simplicity of the dress but wish it were a little more fitted in the bodice. I actually gasped when I saw this live. The veil is AMAZING and I loved it even more after I read the story about the design of it. 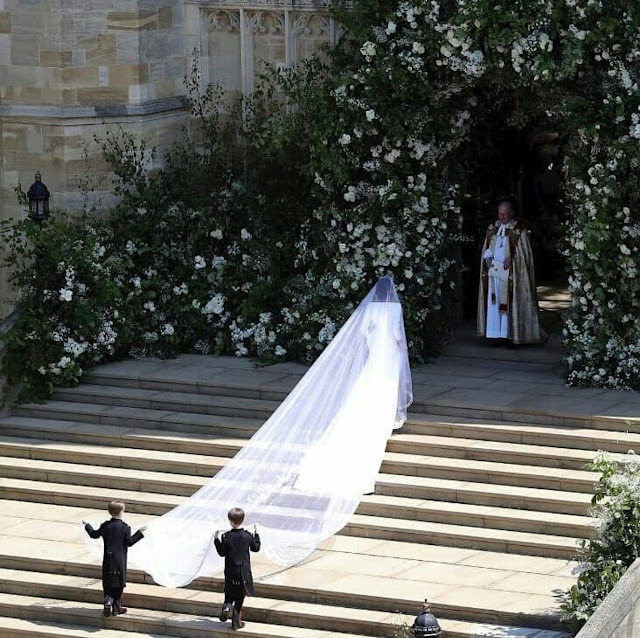 I loved that she had her two page boys carry her veil, too. 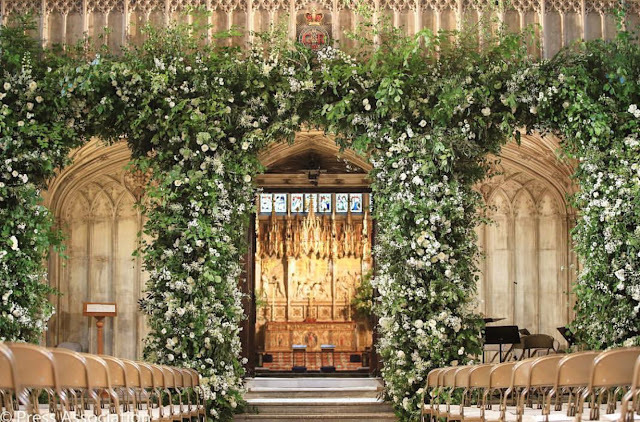 The florals on the archways inside and outside the church were really impressive. 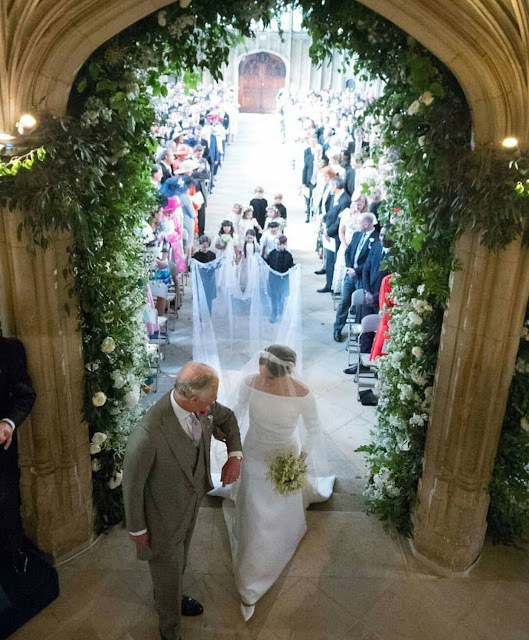 I'm sure her entire flower budget cost more than my entire wedding (because flowers are expensive! ), but I'd say it was worth it after seeing how dramatic it made the church without being too much....if that makes sense. 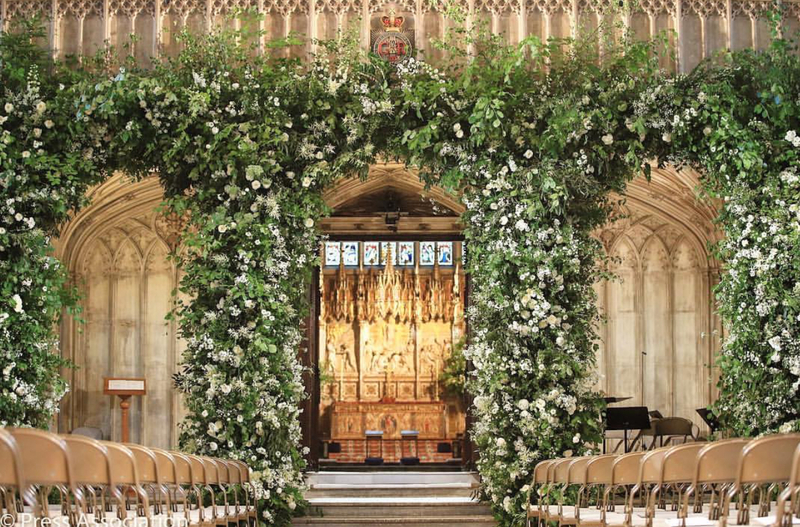 Was it just me or did anyone feel bad for the people who had to sit behind those arches? I don't even know if they could really see anything going on during the ceremony! Meghan's mom was the real MVP of the day. 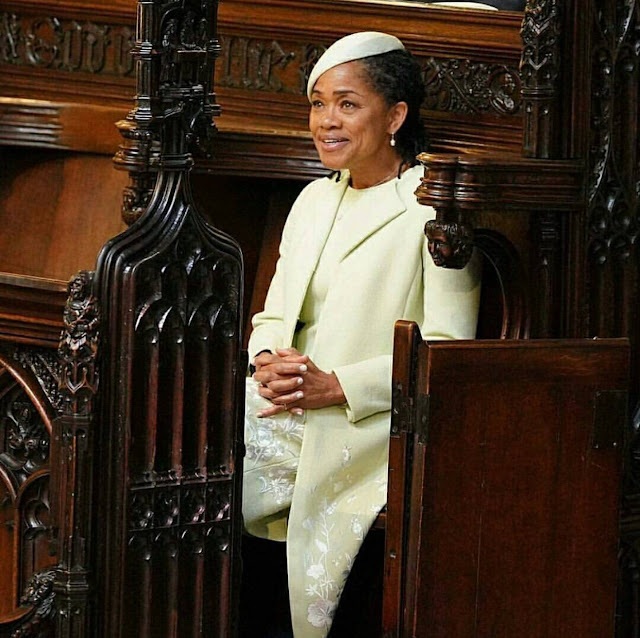 Here we're got a single mom who had to sit alone during the ceremony, who looked to be without any family in attendance, and who is just an average middle class American watch her daughter marry into British Royalty. And she looks so pretty in that color! I was not expecting the halter neckline but now I don't want her to wear anything different! She knocked it out of the ballpark with this dress, and Harry doesn't look too bad himself ha! I know I keep saying "I love..." but there are so many things about this wedding that I loved! 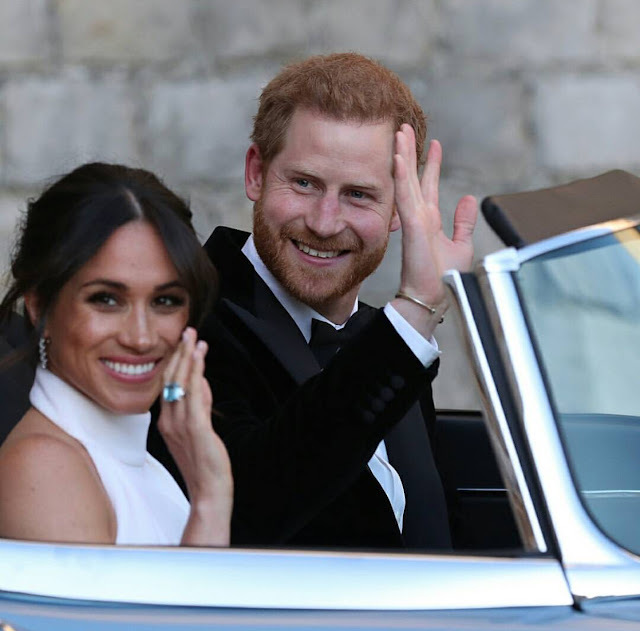 It was so sweet and sentimental that Meghan wore one of Diana's rings, and the blue was an unexpected pop of color with her dress. I'm sure Meghan can wear a potato sack and still pull it off effortlessly. She also makes me want to figure out how to wear my hair in a messy-like bun. 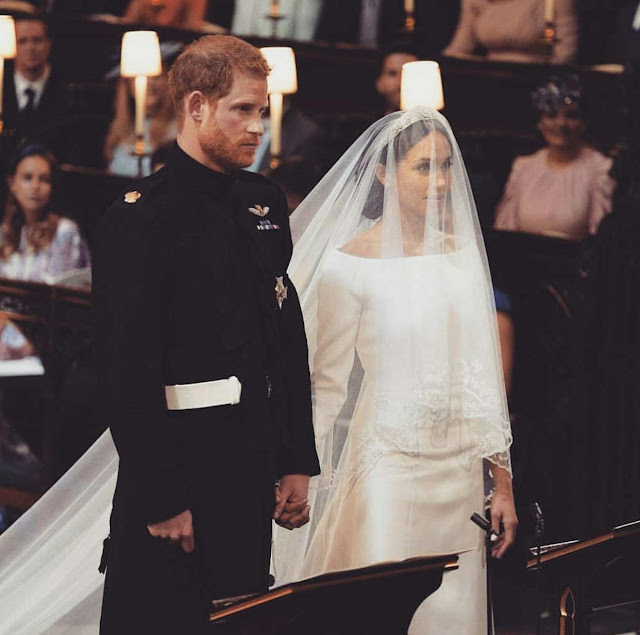 Did you wake up early to watch the wedding? Your thoughts? I cannot think of a single thing I'm reminiscing about. Is that awful? My husband!! If you read my post from Friday about our miscarriage, then you know I've been very dependent upon him lately. He has been extra gracious to me in my grieving and we've spent a lot of extra time together intentionally--and I've loved every minute of it! Honestly, not much of anything because our lives and schedules have revolved around IVF. But we've got lots of things planned for this summer that I'm excited about! Yesterday I posted my summer goals. I think my main one this summer is just getting back into shape and being able to work out consistently. This is really embarrassing, but after watching the royal wedding and not really knowing anything about Meghan Markle, I started watching Suits on Amazon Prime. I'M OBSESSED! It's such a great show and I'll be finished with all 7 seasons next week haha!! I'm reading the Canadian West series currently, but that's been put on hold until I finish Suits haha! Suits....I'm telling y'all, I'm obsessed! An entire month of nothing to do with school!! 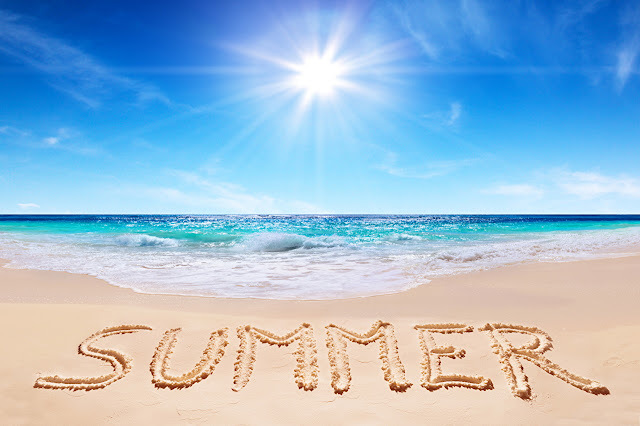 I have a week long workshop in July, so June is going to be a month where I think only of summer! This summer I've decided to keep a running to-do list (or goals) on my phone. Strangely enough, I don't think I came up with a goals list last summer or any other summer before. But this summer I'm adamant about getting a few things done either in the house or personally. Are you a summer goal setter? -buy new bathing suit I did that yesterday!!!! This post was supposed to be different--a happy announcement and not a painful one. I'm writing this post for a couple of reasons though--so many of y'all have been so invested in our story of infertility (I've gotten so many random messages from readers letting me know y'all were praying for us), I've seen first hand lately how important community is and how God uses community to show us His love, and writing my blog is cathartic. This was taken after we had received our call from the doctor and we had collected ourselves and stopped crying! You can see how unbelievably happy we are! How far along: 4 weeks as of Friday, April 20th!!!!!!!!!! We are over the moon about this precious gift from God!!! Our due date is December 28th!! Size of Baby: I immediately downloaded the Ovia app and it says Baby Shaneyfelt is the size of a poppy seed! Gender: We don't even care!! We are just praying for a healthy pregnancy. Movement: None and won't be for a while! Sleep: I didn't sleep any the night we found out because I knew we were telling our families that weekend (more on that below). But starting Sunday, the fatigue has kicked in and it is real. I never thought pregnancy symptoms happened this early, but I really am tired. Symptoms: This may be tmi but I had no idea constipation was a symptom of pregnancy because no one talks about it! Yep. I'm also really tired all the time, and I've had a little cramping which makes me feel better because I know my body is doing what it's supposed to do. And because I've dealt with infertility for so long, I feel like I've become really in-tune to how my body feels, so I can tell that I'm pregnant. I'm bloated and there's a strange sensation--kind of like pressure--in my lower abdomen. It lets me know something is there! Cravings/Aversions: Nothing yet, although I saw someone post about fried chicken and I instantly craved chicken fingers one night. That is so unlike me so Dustin was so sweet and went and got me some! Nursery: We knew what room the future nursery would be before we built our home, so I'm so excited to see it transform! We'll wait until we find out the gender to decorate. Dustin: Is so excited and the best!! He's made sure I've had it easy this week and I can't wait to see him hold our baby!! Best Part of the Week: Finding our we're pregnant! And we had the best time telling our families! Yes, we told early, but IVF hinders any sort of surprise. Our families knew about our transfer so we told them early so they could continue to pray for us. Can't Wait For: This Friday is my next doctor's appointment to check my blood work to make sure all of my numbers are doubling like they should! Then at the 6 week appointment we have our first ultrasound and I cannot wait for that! ...and that's the only weekly pregnancy post I did. Because I was an IVF patient, I went to weekly appointments for blood draws and ultrasounds. My pregnancy test lab results on April 20th were outstanding. We were so positive this was going to be a healthy pregnancy based on how high all of my numbers were. Because I wanted to be hopeful, but also cautious, I quit writing the weekly pregnancy posts. I figured I would pick back up at 12 weeks and we had planned on announcing our pregnancy between 8-9 weeks--which would be today. Two days before we reached the 8 week milestone, we received the news at our doctor's appointment that we lost our baby....the baby we prayed so hard for. Devastated doesn't even begin to describe how we both felt. As we sat in the doctor's office to discuss a d&c, all I repeated to myself was "God is good. He is still good." That profession of God's character was something I had said so many times before to people when discussing our infertility that I knew it was of the upmost importance to remind myself of His goodness in that moment. Even if I didn't feel it. Two days later on the day I would be 8 weeks, we arrived at the hospital at 6 AM for the d&c. I was so numb all morning until the anesthesiologist asked me how far along I was. I cried when I got back to the operating room and the sweetest nurse held my hand and rubbed my forehead until they put me to sleep. I cried when I woke up in recovery and remembered what had just happened. I cried when they wheeled me back into the room with Dustin. Immediately God used His people to show us how loved we were. And instantly I began to see how important Christian community was and why God had created it. People brought us food, wine, flowers, gift baskets, gift cards, and told us they were praying for us. I saw more than ever how perfect Dustin and I are together. I have leaned on him in my grief and he has been so patient and loving with me. Thank you for sticking with it and reading this entire post. Yes, this is a very sad post and the pain is real, but my hope is that you'll see past that and see that our hope remains in Christ. As Christians, we sometimes have to remind ourselves of God's truth instead of listening to our emotions. David cried out in the Pslams, "I waited patiently for the Lord; he inclined to me and heard my cry. He dew me up from the pit of destruction, out of the miry bog, and set my feet upon a rock, making my steps secure. He put a new song in my mouth, a song of praise to our God. 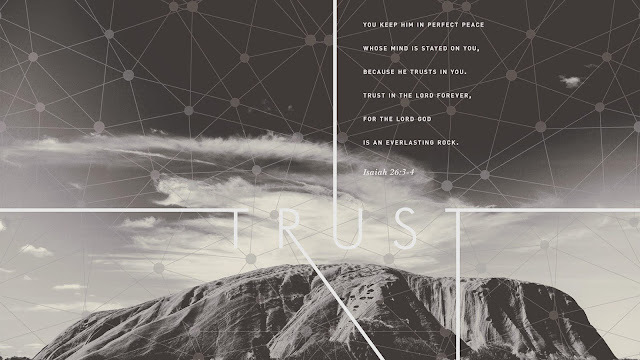 Many will see and fear, and put their trust in the Lord" (Ps. 40: 1-3) Life isn't easy, but we know we don't go through life alone. 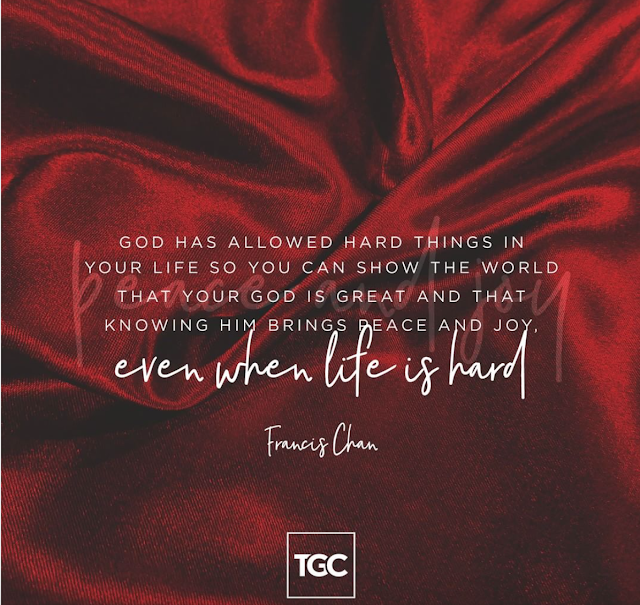 My prayer is that whenever you experience suffering--and you will--that in your grief, you're able to praise God for who He is. **I also want to mention that I had so many people (who didn't know we were pregnant) text me on Mother's Day telling me they were praying for me. God knew I needed that because it was a couple of days after Mother's Day when we found out we lost our baby. I am so thankful for those people who took time out of their day to text me because I had no idea I would be needing those prayers. I'll be back to blogging soon. I had thought about taking time off like I did after we found out we were pregnant, but I miss the community. I've made so many friends from blogging, and I miss the interaction. I know I'll also need the distraction this summer since my summer will be much different than what I had planned on it being. Hi friends! 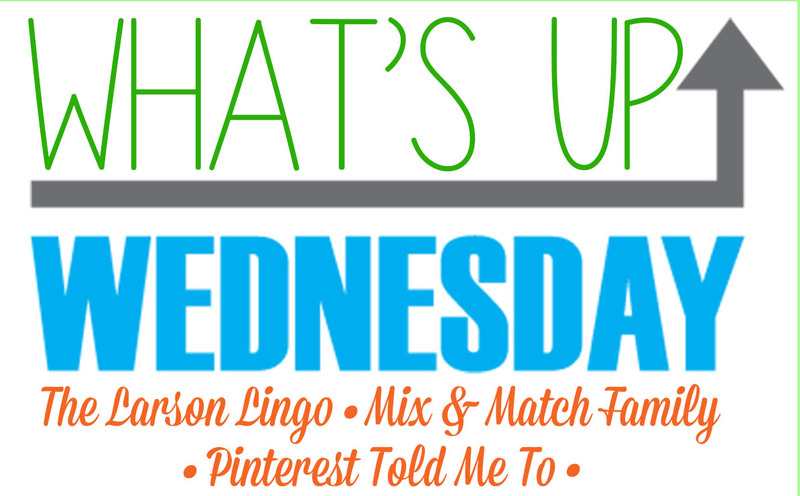 I'm excited to share my April Reads book review with y'all today! I read some pretty good books last month and enjoyed 3 out of the 4, so I say that's pretty good! 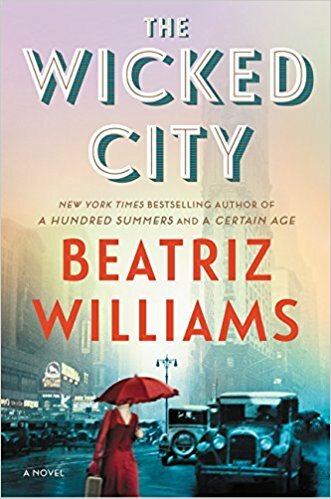 This was my first Beatriz Williams novel and I enjoyed it! It alternates between two different narrators in two different time periods--one during prohibition and the other during the late 1990s (which I found weird...why not present day?). Both stories center on the same apartment building in New York City. I enjoyed both narrators equally and was even shocked at the ending of one of the narrators--it took a twist that even I didn't see coming. There is a small love story, as well, and those are always my favorite! I highly recommend this book for a great summer read! I began reading this book at the end of March and finished in April. 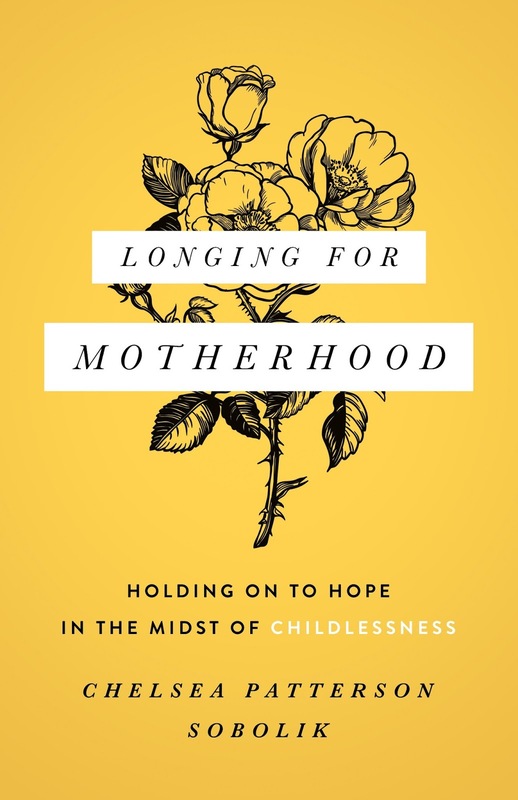 Even though the title makes it seem like it's only for those who long to be mothers, I would say this book is perfect for anyone who is in a season of suffering. The author, Chelsea, does a wonderful job of affirming the need for grief and then pointing you to the hope Christians have in Christ. This book would be great for anyone who is close to someone suffering from infertility or even a woman who is single but still yearns to be a mother because there is a whole chapter on how to help those around you longing for motherhood. I can't recommend this book enough! I wanted to underline whole pages at times--Chelsea's theology is very solid and the Cross is evident! I randomly picked this book up at the library, and it was my least favorite. A man and a woman randomly get married in Las Vegas after a night that they don't remember. It turns out that the woman owns a struggling store in NYC and the guy is part of an important family in Connecticut with problems of their own. Instead of annulling the marriage, they strike a deal to stay married for a year so they would each benefit from the marriage. I'm sure you know what's going to happen--it was pretty easy to pick up on--but the author took way too long to get us to the happy ending! That was my main dislike from this book--the storyline was way too long. 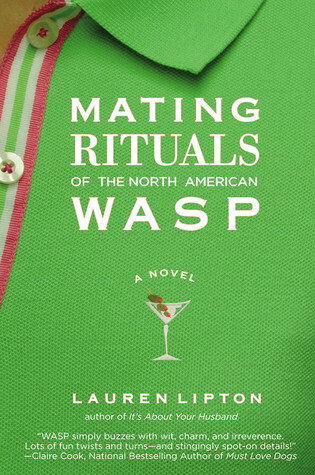 This was my book club book for April and it's one of my favorite books that I've read this year! 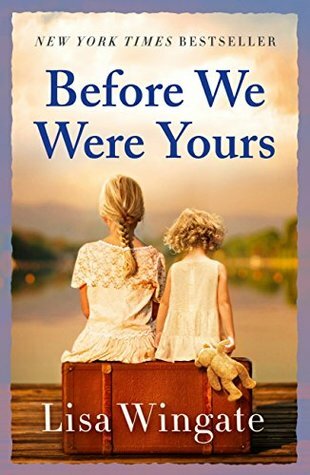 It's historical fiction so it's based on a true story, and the true story is really sad. Apparently the Tennessee Children's Home located in Memphis was caught kidnapping children, changing their names, and "selling" them to wealthy couples looking to adopt orphans. All of this took place from 1929-1950! I highly, highly, HIGHLY recommend this book to y'all! It alternates between two storylines--one present day and one in the past--and both are so gut-wrenching.